Some called president lazy, others uninterested in daily details; some said he was brilliant delegator of responsibility. Whatever viewpoint, it is unquestionably true that men around Ronald Reagan played unprecedented role in shaping & controlling nation's foreign & domestic policy. 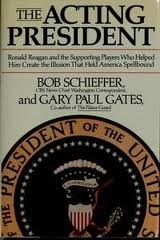 In this explosive book, Schieffer & Gates, working w/extensive network of sources & some hitherto secret materials, show just who these men were & just how they influenced both President & country. You'll read 1980 memorandum dividing up real power of presidency b/w Edwin Meese & James Baker; you'll understand why man was young as Michael Deaver was able to wield such enormous power; you'll witness astonishing Oval Office session on defense budget immediately after Gramm Rudman was passed. You'll meet, in intimate, sometimes painful, detail, not only Deaver & Baker but such men as Donald Regan, William Casey, Alexander Haig & John Poindexter- & what you read will change your vision of the decade.